What Sous Vide Setups Do People Use? We often get asked about what some good home setups are. To showcase the wide variety of options that are out there we've decided to put together this page of equipment that different people use. We've provided as much information as we can about them and hopefully they will give you a good idea on what you can do at home, from expensive circulators to inexpensive "do it yourself" projects and everything in between. And if you want to share your own set up with us just let us know and we will add you to the page! To start things off, here's my setup. I use both a PolyScience Sous Vide Professional, a Mini-Pac MS-20 vacuum sealer, and a Iwatani torch . 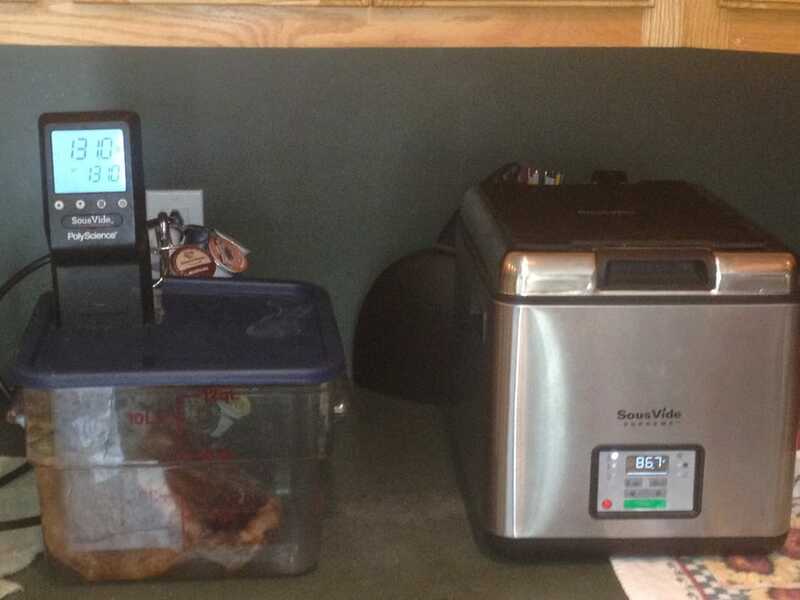 Thanks again to everyone who sent us in pictures of their sous vide setups. Its a great reminder that you don't have to spend much money to get started with sous vide.